Our Cotton Eye Patch attaches underneath the eyeglasses and offers full eye coverage. The eye patch is made of soft breathable cotton fabric that can be washed. 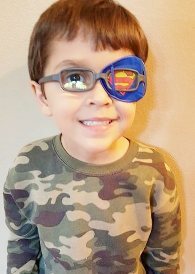 The child size eye patch fits most glasses of children 3-9 years of age. Feeling like a superhero in a Superman Cotton Eye Patch!